Okay, maybe I’m a little late on this one, but since I recently restarted blogging, I have to catch up with some things, especially when I really think, they are worth mentioning. 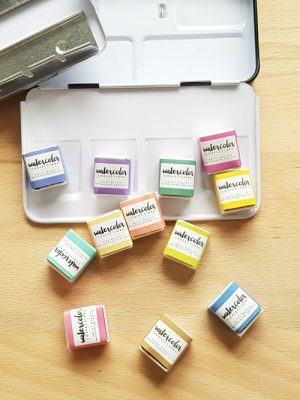 So if you have not been living under a rock, or if you are an alien – or even an alien living under a rock – you probably have already heard about the “prima marketing watercolor confections”. 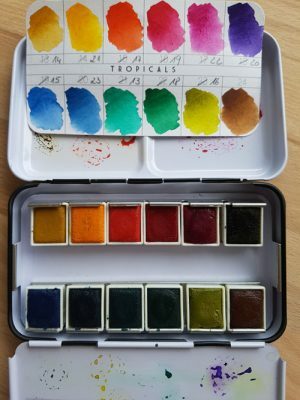 They come in differents sets (some of them are more easily available then others) and today I have a review of the probably most common one – the “Tropicals”. 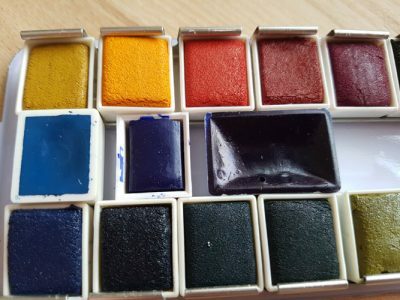 I think that there is a reason for that: besides the classics its the most versatile set in my opinion and at the same time it contains some colors that are a very nice addition to a basic watercolor set. 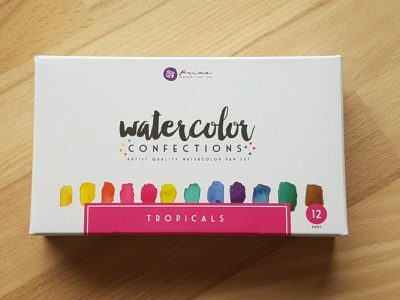 Watercolor Confektions – “Tropicals” by Prima Marketing Inc. Yes! Let’s be real! If you are a sucker for nice packaging – this one is definitely a winner. The set contains 12 half pans housed in a very nice and useful metal tin and when you open it up it looks like a box of candies. 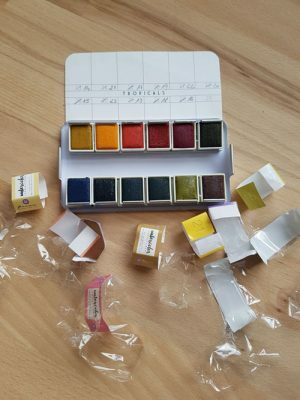 But even if you are tempted to – I do not recommend to eat them, because watercolors may contain toxic ingredients such as cadmium. You will not find any information about the light fastness of these colors on the packaging, but they are described as “artist quality”. 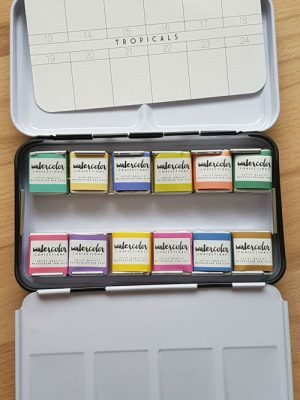 You can remove the middle part of the box as usual, which provides you with a lot of mixing space and in the middle of the tray you can add some extra colors (as you will see later), so it’s perfect for travelling or creating in your favourite starbucks. I found the original order of the colors a bit odd, so I rearranged them. The set also comes with a little card of decent watercolorpaper for your colorswaches. But now let’s dig a bit deeper. One thing I immediately noticed, was the structure, the surface of the color. Compared to other colors I own they look pretty rough, almost grainy. See what I mean? From left to right I added the following pans: “Schmincke Horadam”, “Winsor & Newton Cotman” and the full pan is “St. Petersburg White Nights Watercolor”. That may seem like to compare apples and oranges but I just wanted to visualize, what I mean talking about a grainy texture. And as you can see, you are able to add additional colors, only the “Schmincke Horadam” pan didn’t fit as well, because of the slightly thicker plastic. I love the feel of creamy and smooth watercolors and so – by the look of it, I didn’t expect much, to be honest. I kind of feared that they would be hard to dissolve and not very pigmented at all – but I was wrong. Despite the strange looking texture, they were surprisingly pigmented and easy to work with. The color selection is – you guessed it – tropical. (Surprise!) 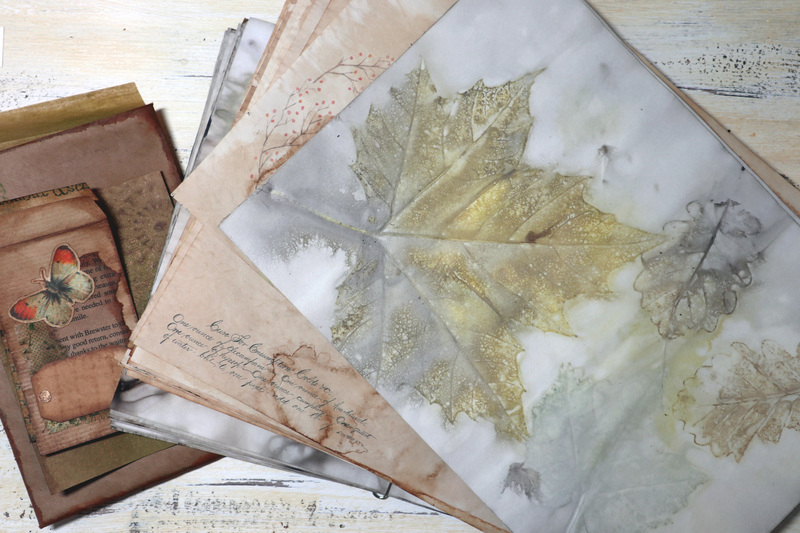 The colors are very nice and perfect for floral artwork, if you want to add some brighter colors to your collection. 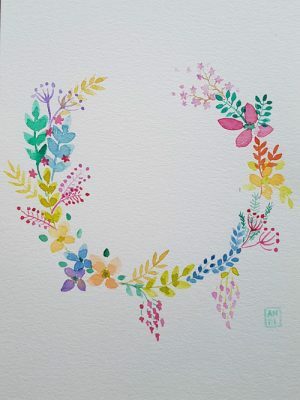 So I quickly sketched a very loose, playful and easy floral wreath with them. (No, floral wreaths aren’t cheesy! They are a very good practice and always help me to loosen up – and flowers simply make me happy.) I intentionally didn’t mix any of the colors so you can see the single shades and how they work together. The only complaint I have is the similarity of the two blue hues, one seems to be only slightly darker than the other. I purchased my set at amazon for 16,90 € (including shipping). It came from the US and arrived fairly quickly. If you are in the US you should have more easily access – maybe even at your local art- or craftsupply-store. I hope you enjoyed this review and found it helpful. I am waiting for another set to arrive, so hopefully I can follow up with the “decadent pies”-set from the “watercolor confections”-series.